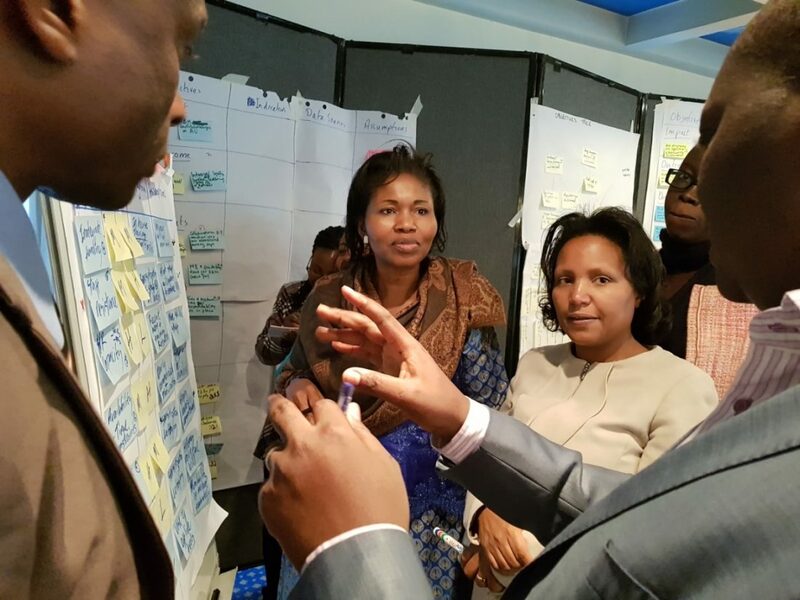 Like many other inter-governmental organisations and development partners, the African Union has been striving to institutionalise RBM approaches and a Culture of Learning in its various organs. The work of the African Union Commission (AUC) is driven by results that are articulated at various levels: in a 50-year organisational vision, a 10-year plan, and medium-term strategic plans. 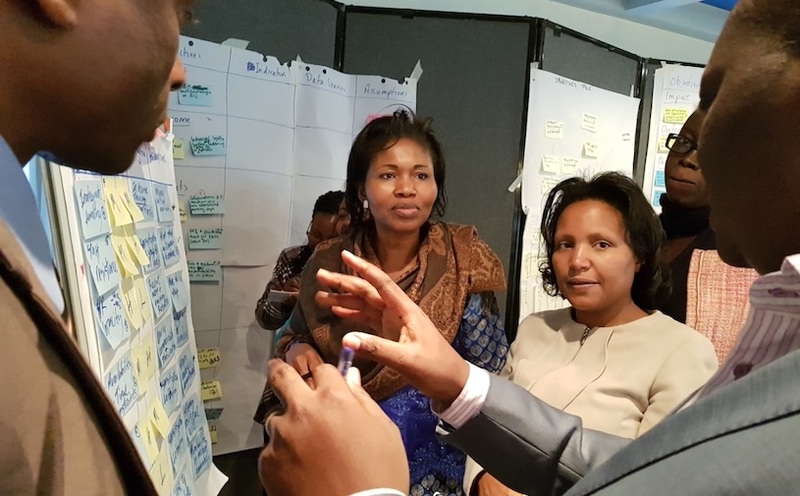 The roll-out of the AUC’s next Mid-Term Plan (2019-2023, with a transition year of 2018) presents an opportunity for the organisation to further strengthen RBM – and Strategic Planning in particular, both in terms of how the new plan is communicated and how it is implemented. 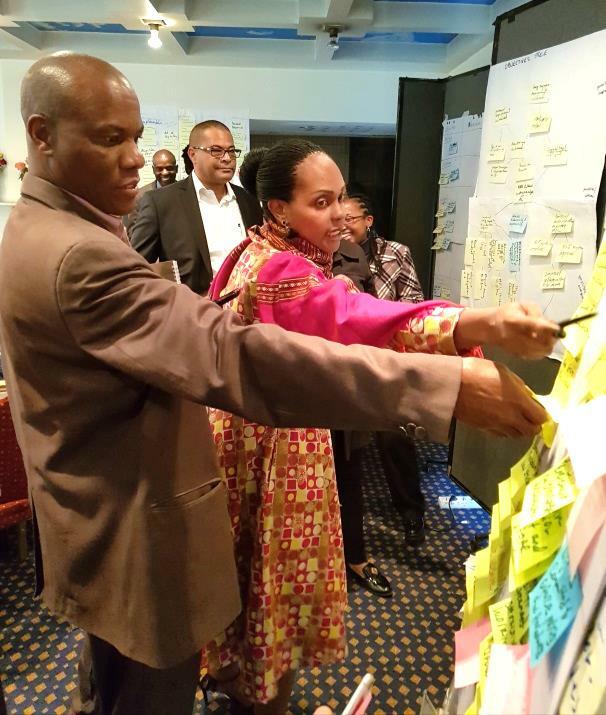 It is in this context that the AU’s Learning and Development team invited the Centre for International Development and Training (CIDT) to develop and facilitate a five-day training on ‘Strategic Thinking Tools’ for twenty staff members of the AUC and the African Court on Human and Peoples’ Rights (AfCHPR). Participants comprised senior and middle management officials with diverse technical backgrounds and were drawn from the Departments of: Trade and Industry, Economic Affairs, Social Affairs, Peace and Security, Strategic Planning, Peace and Security, Political Affairs, and service departments such as Human Resources, Finance and Administration. 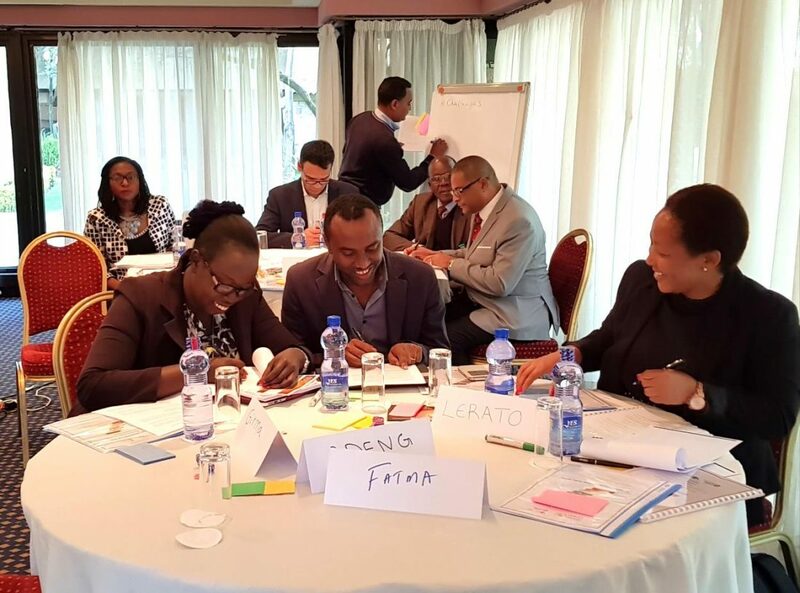 The workshop took place in Addis Ababa, Ethiopia and was co-facilitated by CIDT’s Head of Centre, Professor Philip N. Dearden, and Senior Lecturer, Kimberly Kane. The sessions were highly interactive, practical and tailored to the context of the AU. They covered CIDT’s signature ‘Seven Simple Steps’ for designing a Strategic Plan, a Programme or a Project — and much more, including discussions and exercises on: prioritising focus areas/objectives, communication strategies for the Strategic Plan, linkages and alignment between various results frameworks, mechanisms for continuous learning, promoting a results-oriented culture, and addressing implementation challenges. Recognise the value of Strategic Planning – especially its participatory, inclusive nature – and the importance of continual Strategic Thinking processes. Understand the concept of Results-Based Management (RBM) and how it relates to Strategic Planning. 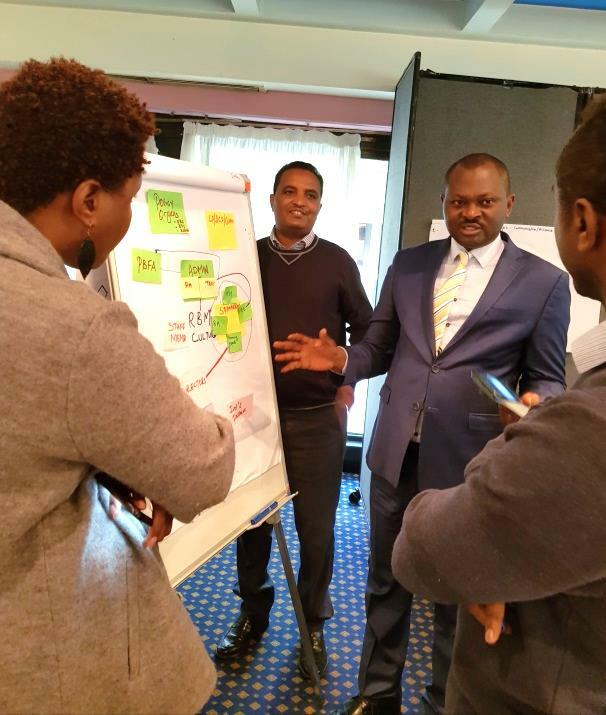 Become familiar with a variety of “Strategic Thinking tools” that are applicable to Strategic Planning, Programme/Project Design and RBM in general. Acquire a strong foundation for developing a full Project, Programme or Strategic Plan to address their current organisational needs. One hundred percent (100%) of the surveyed participants either agreed or strongly agreed that all of these objectives were achieved. All participants would also recommend that a colleague participate in the course. They particularly appreciated the training pedagogy and capacity development techniques as well as the professionalism and skills of the facilitators. “They have rich experience that allowed them to be flexible and adapt situations to all,” said one participant. Another added, “They really know the topic and very well aligned it to our level”. Above: The participants were given several real case studies to read, reflect upon and discuss. Some excellent conclusions came from those discussions and can be applied to their work going forward. 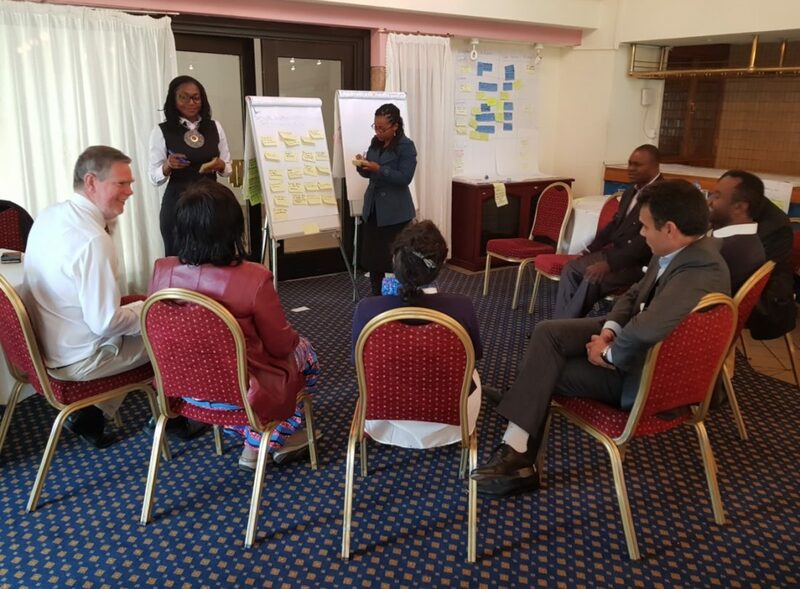 Above: The workshop covered a set of practical and participatory tools that are relevant to both strategic planning and the design and management of programmes or projects. The participants practiced using those tools by developing their own internal Organisational Development projects. Above: Participants in one of the three working groups conduct a participatory Risk Analysis for their chosen internal project. This tool helped them determine the assumptions in their Results Framework as well as propose mitigation actions to reduce the likelihood and/or impact of the identified risks. Above: The participants had opportunities to apply the techniques and tools that were taught in the workshop. Here, a couple participants are facilitating a break-out session, with support from Philip Dearden (left). 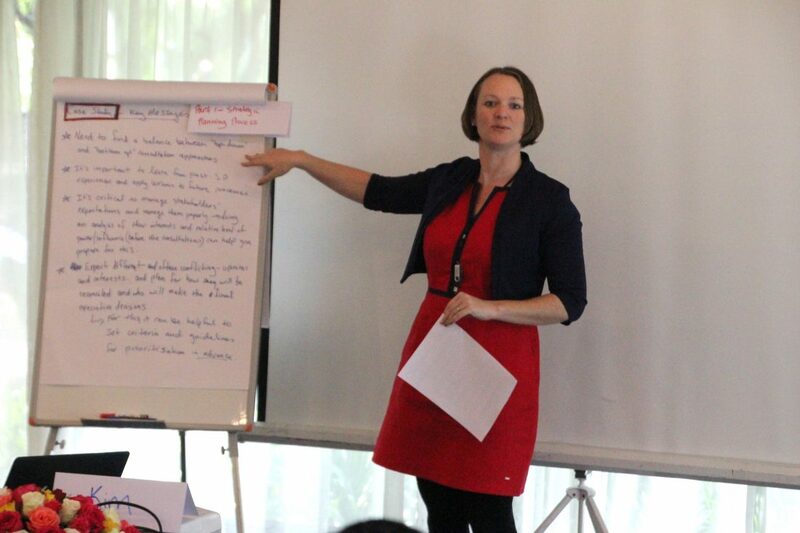 Above: Kim Kane conducts a debrief in plenary of the group discussions, highlighting key messages and learnings about the consultation process involved in Strategic Planning.